So, when you have been consulting for a while (21 years in my case) I find it is important for others to know you are still out there. How can you best keep your name in front of the companies that might consider hiring you? One way that I have found that works is to sponsor events. No one has the budget to sponsor all of them, and likewise I do not believe you need to sponsor at the highest contribution level. However, selective sponsorship is an imp…ortant part of my business development plan. 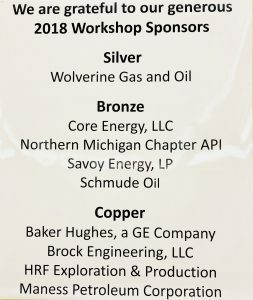 In this case, our local Petroleum Technology Transfer Council (PTTC) folks were holding a workshop recently in Traverse City, Michigan. It didn’t take a lot to let folks know that Brock Engineering supports the workshop and we are still out there. And a direct measurement of the dividends of this investment may not ever be quantified. However, it was worth it. What are ways you let others know that your consulting practice is alive and well out there?